OS X Lion seemed unpolished, and, worse, not innovative. When Mountain Lion dropped a couple weeks ago, we were pumped: It was a relatively rapid update, and we hoped it would address our concerns. Hrmph. I've been using Mountain Lion for more than a week now, and I got the same feeling I got from Lion: Scott Forstall—Apple's own Doctor Moreau—is still pushing for an ungodly desktop/iPad hybrid. This is not the future; it's a patched up genetic experiment anchored in Apple's past and present successes. For all of Mountain Lion's good new features—and there are a few—the new OS raises a terrifying brace of thoughts: that Apple has run out of ideas. Or worse, that Apple is too afraid to implement new concepts, fearing it will kill the company's golden goose. Too afraid to change the world once again, as Steve Jobs used to say, one desktop at a time. Mountain Lion has the same Finder and the same app-centered approach as its king-of-the-jungle forbearer: more of the same gimmicky interfaces full of leather and ripped out pages; more outdated graphic metaphors and unnecessarily cute eye candy. And yes, it has a few good new features, which are useful and welcome, but nothing zowielala amazing or innovative. And some of these new good features also have dark sides. Notifications is a great way to keep track of whatever is important. You can choose which ones you want to receive with the control panel. And in Apple's Mail app you can star people, so only emails from those starred people appear in the Notifications panel. This functionality could be available in third-party apps as well. After iCloud, my other favorite feature is AirPlay Mirroring, which lets you beam anything that can play on your Mac screen to any Apple TV or AirPlay-enabled AV receiver or projector. That includes Adobe Flash and Microsoft Silverlight content, DVD discs, and any other video playback app. So you could see any movie or TV series without having to go through iTunes. I'm actually amazed that Apple did this, since it opens a hole in the walled garden. In fact, I live in fear that this feature won't be fully available in the final version. After all, Apple doesn't allow Hulu in Apple TV—not even through Airplay—because it competes against the iTunes store. Apple says there are over a hundred new features and refinements, like Twitter sharing implemented across all apps. Or Safari's new unified address bar which, like Google's Chrome, can now accept search queries and web addresses in the same field. I really like having my mail take over one screen and Chrome with work-related tabs on another; I have Chrome with for-fun tabs on another, and then a frame full of Reeder a swipe away. It's so convenient and fast to flip through them. And it helps me to focus on tasks, with the new Notifications acting as a central link to the rest of my activities while I'm zeroing in an article or editing some video. It works. To a (sore) point. 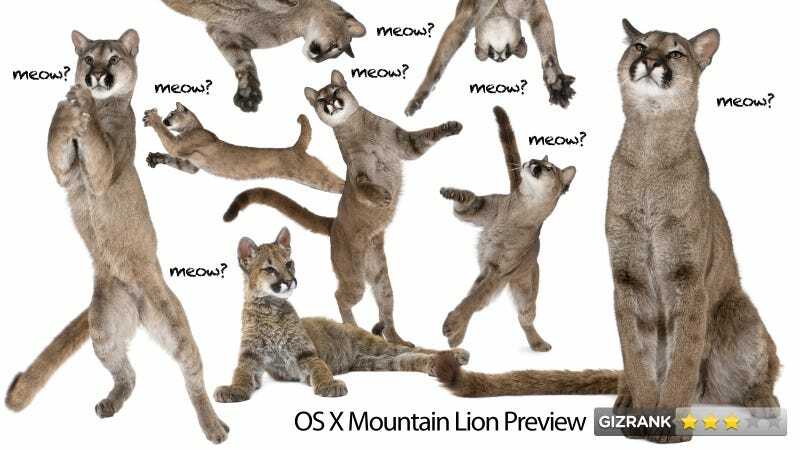 This is a review of the beta version of OS X Mountain Lion. While I found some bugs and performance problems—it screwed my iMac's sound output, for example—these are normal in beta products. This review disregards those bugs and only analyzes the feature design.